What’s that mantra in real estate: location, location, location? In my mind, the juxtaposition offers a wonderful, if subtle snapshot of Washington’s new power balance. If Rove stuck Bush in the library hoping for a sense of intimacy, history or thoughtfulness, the placement only highlights how out of place and out of character the President appeared. In contrast, compare Bush’s “situation” with the shot by A.P’s Charles Dharapak (a slight variant of which also appeared in the NYT news analysis on the speech). In reality, the photo was taken outside the front entrance of the West Wing, where members of Congress typically meet up with the press. 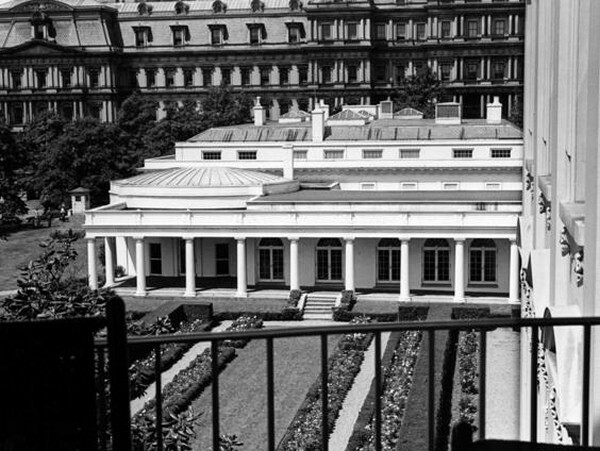 In light of the strength and confidence Reid and Pelosi are exuding these days, however, the image conjures more the feeling of the famous West Wing colonnade, traditionally the President’s bastion off the Oval Office. (For some “big shot” examples, try: 1, 2, 3). Such is the state of things that, even in Bush’s (supposedly) bigger moments, Reid and Pelosi seem closer to the power than the President does.